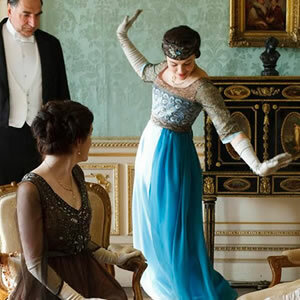 If you’re a sucker for period dramas, eyebrow-raising aristocratic behavior and jaw-dropping Edwardian-era costumes (Spanx ain’t got nothing on a good corset! ), and haven’t been watching PBS’ Downton Abbey, it’s time to get on board with the British series that has won viewers around the world (its of the most successful shows in “Masterpiece” history). The plot revolves around the patrician Crawley family (which includes their three beautiful and deliciously drama-filled daughters) and their servants–both social sets have their own heaping of oh-no-he/she-didn’t! moments. I was late to the party on watching Downton when the series first aired, but caught up online by watching it here (free). Now I’m all caught up and will be watching (perhaps with a Pimm’s Cup?) tonight when season two debuts in the throes of World War I.
It’s not hard to imagine that the fashions donned by Newport’s robber baron families who summered in their Bellevue Avenue mansions during the era dressed much differently. Rosecliff’s Tessie Oelrichs was known for her lavish parties at the mansion, which is why she had commissioned the largest ballroom in Newport when working with architect Stanford White (one party’s guest list included famed magician Harry Houdini). 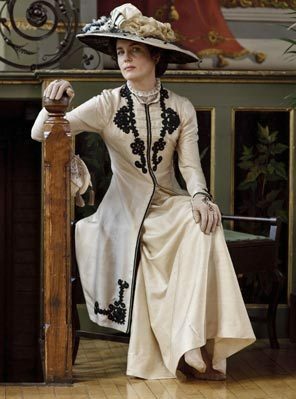 In fact, Downton begins with the announcement of the Titanic disaster, and the sorrowful lost of family friend John Jacob Astor IV who went down with the ship (and was the son of “The Mrs. Astor” of Newport’s Astors’ Beechwood mansion). Click here for a recent Q&A with the series costume designer, Susannah Buxton, from the Wall Street Journal. 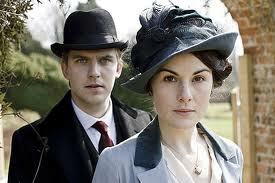 Downton Abbey’s Season 2 returns tonight on PBS at 9pm. Here is a glimpse of the fashion seen in season one. 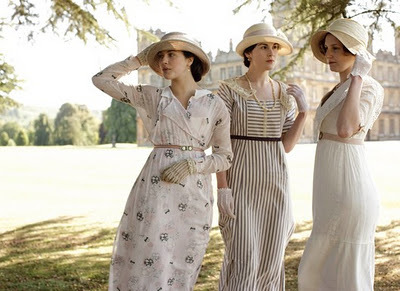 What’s your favorite Downton look? Entry filed under: Fashion, Uncategorized. Tags: Asors ansion Newport ri, “The Mrs. Astor”, Daisy Buchanan, Downton Abbey, Downton Abbey costume designer, Downton Abbey costumes, Downton Abbey images, Downton Abbey Lady Sybil, Downton Abbey Newport ri, Edwardian-era costumes, John Jacob Astor IV, John Jacob Astor IV Astors Beechwood, John Jacob Astor IV Newport ri, John Jacob Astor IV Titanic, Newport ri Bellevue Avenue, Newport ri Bellevue mansions, Newport ri mansions, Newport ri Rosecliff, newport ri shopping, Newport ri silver heiress, Oracle Astors Newport ri, PBS, Pimm’s Cup, Tessie Oelrichs, The Great Gatsby costumes, The Great Gatsby Newport ri, Titanic Newport ri, view Downton Abbey, World War I fashion. I’m so hooked on this…it’s just wonderful to have something so grand to look forward to watching on television for a change! ~M. Me too–I had to play catch up by watching the first season online because I had heard so much about it and I was hooked by the first half hour!